So you walk out into your yard to admire all your hard work. You stroll by your roses and meander over to your beautiful hydrangeas, only to see a pile of yellow slime in your mulch. “What is this?”you ask. Has some rogue animal taken sick amongst my begonias? Has my kid decided to use my flower beds for a science experiment? Before you take your dog to the vet or scold your kids, rest assured that this slime mold is not harmful-nor will it harm your plants. 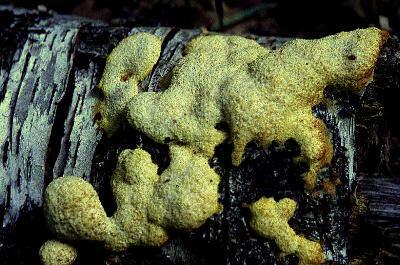 This unsightly yellow blob is a slime mold called Fuligo septica, better known as “Dog Vomit Slime Mold”. It belongs to the Phylum Myxomycota in the Kingdom Protista. This brightly colored fungus spreads across wood mulches during periods when temperatures are warm and humidity is high. Do not be alarmed. Although ugly, it is not harmful to your pets or children. Unfortunately there is no way to get rid of it other than picking it up with a shovel or raking it into the mulch. Although I have not tried it myself, I have been told that baking soda will break down the mold. Here is another great article on slime molds called “The Elegance of Slime Molds” If you have any additional comments or questions please let me know.